We’re thrilled to announce the beta launch of our newest feature, the Challenge! The auto-graded, mobile-ready Challenge is designed to help measure students’ understanding of a given topic and provide different ways for them to apply what they’ve learned. Right now, the Challenge accompanies more than 50 cross-curricular topics, including everything from the Bill of Rights and Hybrid Cars to Moon Phases and Titanic. (Look for its mountain peak icon to the right of the movie player.) Down the road, we’ll be adding it to just about all of our topics. 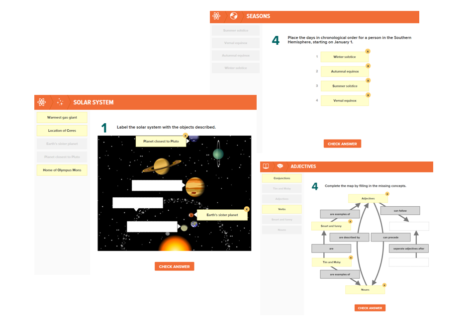 Each BrainPOP Challenge is a set of relevant activities that emphasizes cognitive skills: concept mapping, diagram labeling, matching, multiple response, sequencing, and Venn diagramming. You’ll find four of those six tasks in each Challenge, depending on the topic at hand. Students can submit completed tasks for feedback, via My BrainPOP. Ready to get started? BrainPOP Educators’ Challenge Teaching Resources offers a range of ideas, tips, and best practices – including strategies for differentiating and supporting your students’ varied needs. We’ll also host a free webinar dedicated to the Challenge and our primary source activities on Wednesday, September 14. Register today to reserve your spot!